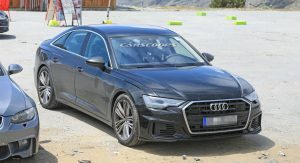 If you happen to find Audi‘s latest A6 lacking a bit on the dynamic front, feast your eyes on what the upcoming S6 version will (nearly) look like. 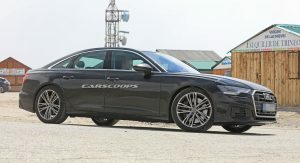 Its Prologue Concept-like design features are further accentuated by the more aggressive front and rear bumpers. 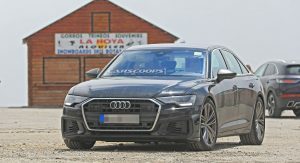 Unlike with the regular A6, this prototype’s front spoiler is visibly more bulky, whereas the quad-pipes at the rear give the car away as a high performance model. 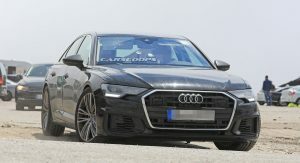 What’s missing here is the S-specific razor-blade-like grille, as seen on the S5, and the faux-aluminum mirror caps. 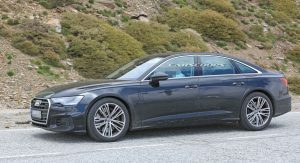 Short of the flagship RS6 version, the new S6 is about as good as it gets within the all-new A6 range. 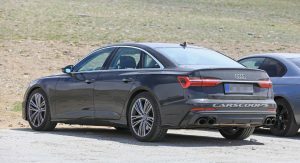 However, if the more aggressive bumpers, bigger brakes and quad pipes don’t “do it” for you, rest assured that in RS6 guise, the car will look even more muscular – it might even get wider fenders. 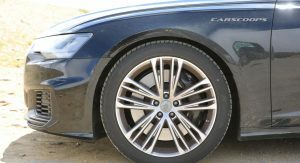 Until then, this is what you’ll be relying on if you’re an Audi customer and you want an alternative to the BMW M550i or the lower end of the AMG-powered E-Class spectrum. 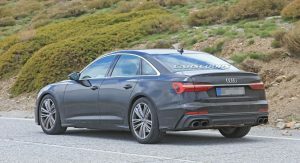 Alright, we don’t actually “know”, but we can definitely make a well-calculated guess judging by how well we know Audi and their current S6, which we reviewed a couple of years back – you can read about it HERE. 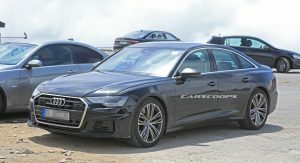 We expect the cabin to feature a sporty flat-bottom steering wheel (S-Line) like in the new 55 TFSI version, an aluminum pedal set, sportier seats, carbon trim, special menus and various S6 badges. 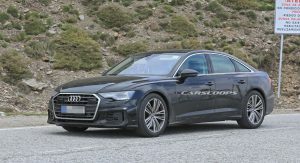 Other than that, drivers and occupants will get to enjoy the all-digital MMI touch response system, modern connectivity and driver assistance systems, ambient lighting and plenty more 2018-worthy goodies. What’s lurking under the hood? 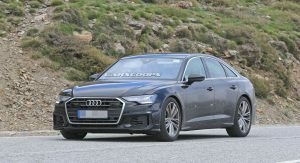 If you could choose between the twin-turbo 2.9-liter V6 in the RS4 and RS5 duo, and the 4.0-liter turbocharged V8 from the Porsche Panamera Turbo, we’re betting you’re going to opt for the latter, especially in a mid-size saloon such as the Audi A6. 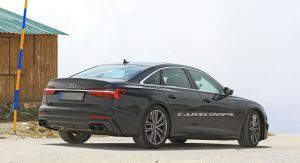 While the latest rumblings claim that the all-new S6 will get the V8 with around 500 PS (493 HP) instead of the Porsche’s 550 PS (542 HP), (most) other sources are betting on the afformentioned V6. 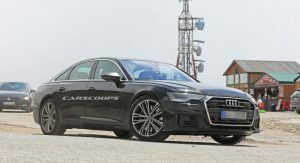 If Audi decides to stick with 450 PS (like in the RS4/RS5), that would put the 2019 S6 at a 12 PS disadvantage compared to the M550i. 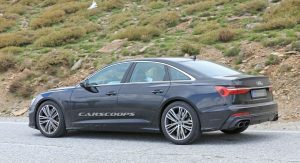 While the all-new Audi S6 is expected to be unveiled sometime next year, an official appearance before the end of 2018 cannot be ruled out. looks good. 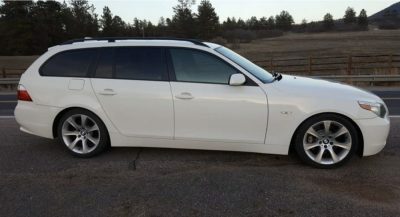 when i squint, and look at certain angles it sort of looks like an older lexus lS. 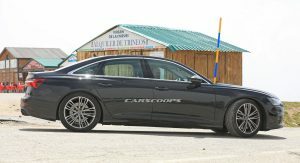 It’ll look just like a slightly larger Audi S4. Happy? 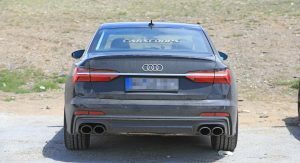 Exhaust tips are huge for quad on a sedan. Second best looking of the new head of design kids (A7#1). Just mentioning ( car magazines get this wrong frequently ) that the 2,9 Biturbo engine is developed by Audi not Porsche. 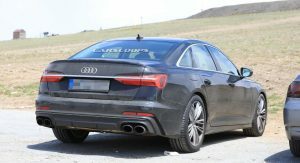 I can already tell, the sporty editions of this A6 generation will look good. It does look good. Hope it gets the V8! Next PostNext Audi’s Making Catamaran Racing Sailboats Now?